Did you know there is a food desert problem in the US? Food deserts-not to be confused with desserts- are defined as ‘parts of the country vapid of fresh fruit, vegetables, and other healthful whole foods, usually found in impoverished areas,’ according to the American Nutrition Association. The ANA goes on to say that these deserts usually exist because of a lack of grocery stores, farmers markets, and the like. It may be difficult to imagine a world in which the grocery store or your local farmer’s market is more than a few minutes from your home, but the reality is that countless families are living in areas that have no grocery store in sight, but instead fast food, quickie marts, and other places that only carry processed, and sugary foods. In fact, a recent report by Enterprise Community Partners tells us that ‘currently, 6 to 9 percent of all households do not have access to healthy food and 30 million people in the United States live further than one mile (10 miles in non-metropolitan areas) from a large grocery store.’ This lack of nutritious options plays a direct role in the food that shows up on the dinner table, and the lunches that your child takes with him or her to school. What’s being done to address this problem? Initiatives like the Arcadia Mobile Market in DC, and Beaumont, Texas’ Get Fresh Beaumont are popping up all over the country to bring fresh, healthy foods to low-income communities and places that aren’t located in proximity to a large food provider or farmer’s market. It’s important that these foods translate into healthy lunches for students. So to take it a step further, we have (with the help of Pinterest) rounded up a few examples of good-for-you options that your kids can take with them to school. #1 Sandwich Kabobs: A kid-friendly take on the traditional kabob, you can see more on this lunch here. #2 Fiesta! : To change it up a little from the normal PB&J, this Mexican-themed lunch will make all your child’s classmates jealous! #3 Homemade Spaghettios: You can’t go wrong with this healthier take on a classic, paired with some fruits and veggies on the side. #4 Turkey/Provolone/Lettuce Roll Up: Wrap it up! This lunch is a win-win for your student. #5 Baked Chicken Fingers: ‘I don’t like chicken fingers,’ said no kid ever! You don’t have to feel guilty about this baked version, and your child will love them too! Community ONE believes that students can excel at whatever they put their mind to, but it starts at home. Happy, healthy students will be more successful in and outside of the classroom. 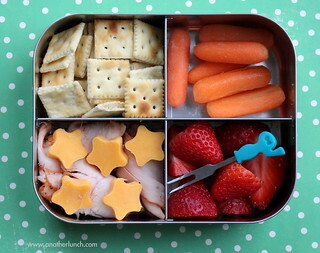 These lunches are just one step you can take to ensure that your child is prepared to excel in everything he or she does.